What’s there to love in a place you’ve never been before? Shangri-la doesn’t exist at all, but flying home from Kathmandu, that ever reborn medieval city nestled there under the great white teeth of the Himalayas, I couldn’t stop reading the book Lost Horizon by James Hilton. Love the place he congers, and the dated myth of it all. And the imagery I found for that part of my three successive articles I wrote for this newsletter on “new paradigm thinking,” after a conference on the subject in Baku, Azerbaijan, was just fabulous: many different cheap paperback covers – I have no idea how Hilton lined up so many publishers. The poster ads for the two terrible movies about the tale were great entertainment in themselves: Airplane crash in the snowy crags. Rescue by Tibetan mountain porters. Love story of an impetuous young man from the world outside and the beautiful Chinese maiden who looked a young 25 but was actually 250 because up there in the almost tropical pocket of that small lamasery kingdom hidden beyond range upon range of threatening peaks, aging took forever. 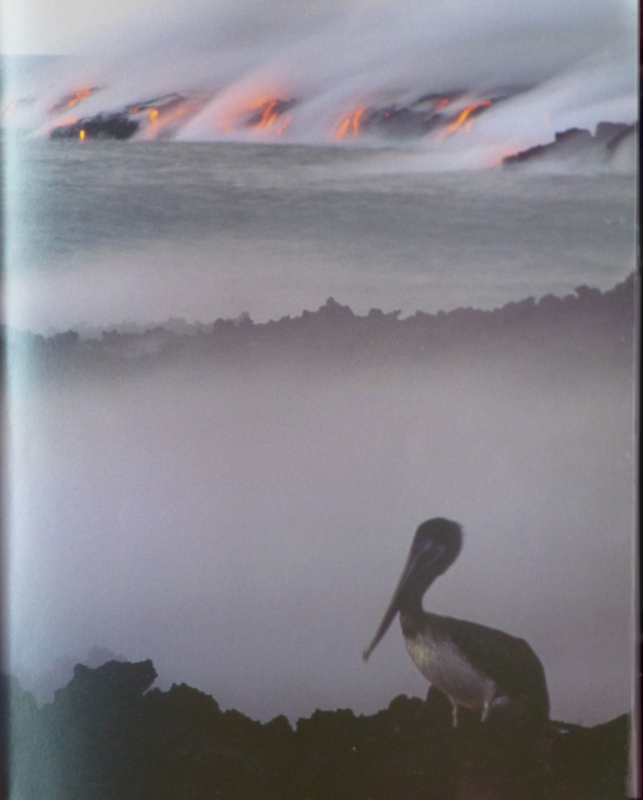 With the Galápagos it’s not a myth at all but a reality – and a powerful one on this planet at that. turned over his collection of soon to be famous finches to an artist specializing in birds – many people had several specialized competences back then. John Gould identified them not as variations within a species, say like Pekinese dogs and Saint Bernards, but as completely different species. Other classifiers soon agreed. So installment #1 in my Galápagos series laid out a list of evolutionists, dedicated scientists on a rigorous quest for The Truth utilizing our God given or evolution delivered physical senses, developing the theory up to today’s theoretical physicists saying the largest most pervasive phenomenon defining evolution could be called “emergence.” That is, new and unpredictable things and functions are coming into existence as time flows on in a kind of “descent with modification,” terminology that Darwin would approve of, but taking place from the sub atomic particle level to the total vast cosmos throughout all time, not just on the biological/ecological level in Earth’s time only. This installment, #2, this one, will be some of my favorite ideas and images, facts and speculations that catch my attention and influence my intention. And that next intention, installment #3, is to try to help build a small ecotown on the Galápagos, or rather more humbly, encourage a reshaping of the small town of Puerto Ayora on Santa Cruz Island, including an “ecocity fractal” neighborhood of a few blocks. I’ll be working out that scenario something like I did for Berkeley in my 1987 book Ecocity Berkeley – Building Cities for a Healthy Future. The Enchanted Isle as they were early known, las Ilas Encatadas in Spanish, could perhaps be best described in the few minds that knew anything about them as schizophrenia of the approach-avoidance kind made geographical and ecological. At least as seen in the minds that saw them by stumbling across them or by fiercely exploiting them or by trying – disastrously for a century or so – to settle them. The isles were oddly an unforgiving desert (unless you wandered quite a distance inland and up slope to the moister zones) with by contrast, a bounty of food that was easy pickings from on foot, wing and fin there. It all started when the Bishop of Panama, Thomas de Berlanga by name, was ordered by the Pope to head on down to Peru and mellow out the violent power games between the gold crazed barbarians called Conquistadors and stop their horrendous abuse of the native population – murder, slavery, you name it. (He failed. Pizarro won.) But before he got to Peru de Berlanga’s boat was becalmed and drifted for days with the current arriving in 1535 on the Galápagos Islands. Finding no water he assessed his situation quickly and departed as soon as the wind came up, east 700 miles to the coast of South America. Berlanga and his crew were saved by birds so tame one could walk right up to one and dispatch it with a club for dinner. And many of the tortoises had two hundred pounds of meat for the hungry, not to speak of the fish in the sea that were everywhere. The lack of water looked like a real killer though, and so off he went first opportunity, so fast and bleak about the place that he didn’t bother to claim it for Spain or name it. Myth developed, though, and the island became ambiguously know as the Enchanted Isles because they seemed something of an apparition. People tended to take sailors’ tales as famously half true, half delusion on the lonely high seas and half boast at best. A 150% tale couldn’t possibly be trustworthy. It couldn’t possibly be that bountiful and desolate at the same time. Swimming lizards eating seaweed and sneezing concentrated salt spray and birds so ignorant as to land on your shoulder or even your gun barrel might not be as fantastically dramatic as sea monsters big as your boat, but they had little to compare with back in Europe or even on the mainland of South America. It sounded amazing, maybe good, maybe bad – if it were not really just a rumor. The pirates were not that many in proportion to the wild animals on and about the Galápagos and the pirates’ damage a bare beginning. But the whalers that followed managed to drive dozens of Galápagos species to extinction while almost eliminating several species of whales, and not just locally but around the whole world. Not only did whalers use captured tortoises to eat, but to eat well into the future way out at sea. These animals in their shells were more or less like bilge-temperature refrigerators in the bottom of the ships because the animals would stay alive close to a year with no food, a long journey’s blessing. The whalers overlapped the five weeks of Darwin’s visit, before and after during a century and a half until whaling was forbidden with a ban agreed upon in 1982 by the International Whaling Commission. Three countries hold out and still do whaling if minimal compared to historic levels: Japan, Norway and Iceland. The whalers caused tremendous damage both before and after Darwin’s visit. Worst of their doing was introduction, both purposeful and accidental of invasive species, especially of goats. Next came the settlers who had one scheme or another about how to make money or how to escape the strictures of prejudice against their religious, nudist or other beliefs. The tale would be comical in some ways if not for one venture after another ending in starvation or violence, human against human. One small colony was built around harvesting the lichen called Dyers Moss that grows on the scalesia trees, the idea being to extract mauve colored dye. I had no idea people once thought mauve was a mass market opportunity, but they did, though the market didn’t. In wondering why people would have come I speculate it was likely the sort of hopeful thinking and desire to start from scratch without the strictures of oppressive society – “society’s pliers” in one of Bob Dylan’s songs. “Little did they know,” to quote Vonnegut. It sounded empty – of other human interference like the American West but whereas those of European ancestry discounted the Native Americans living where the United States is now located, in the Galápagos there actually was no real human presence before the settlers arrived from eastward. But eventually some of them started to get it together and collect enough water and find the rare pockets of soil amenable to European and South American produce to survive – barely – until the US built a base there during the Second World War from which to patrol the eastern Pacific and shortly after, the birth of tourism on the Enchanteds. After that it was remarkable how respectful so many back on Ecuador’s mainland and a large fraction of the actual settlers on the island, many going into the tourist business, became. I again speculate, this time that Darwin and his ever so serious, sincere and methodical quest for the truth of the ecological matters of evolution did in fact have a profoundly positive effect – and his theory was by the latter 1800s world famous, which undoubtedly helped greatly. The regulations and the progress of science for preservation of the island’s species in fact are a major accomplishment of the best of humanity’s efforts for understanding of and support for the wild, the natural, the beauty of things slowly, slowly… evolving: Make the planet great again! only seaport for shipping of food, hardware and other goods to the islands. It’s inspections for the purpose of stopping the entry of invasive species, from the microscopic to the larger and more obvious, are rigorous. 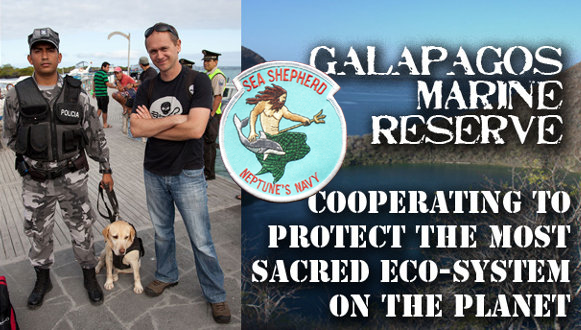 law enforcement, hosted by, among others, the intensely activist “Neptune’s Navy” the Sea Shepherd Conservation Society, co-hosed by the General Prosecution Office of Ecuador and the Galápagos Marine Reserve. • Ecuador has written into its constitution the rights of nature and Mother Earth. In spite of best efforts, damaging species slip in. One of the most destructive is a fly Philornis downsi, probably introduced in a shipment of fruits from Brazil or Guyana. It’s larva, aka maggot, hatches from eggs laid by fruit loving adult flies. But the larva go for blood, get into the nasal passages of hatchling birds and drink blood and nibble away at delicate flesh, graduating as they get larger, to pick at the outside skin of the young birds. Full nest mortality is almost always the result. These “parasitic nest flies” have come to infect 18 of the 24 ground dwelling species of birds on the Galápagos Islands as of the most recent article on the subject I could find relates, and they threaten more species including all of Darwin’s famous finches. Counter measures have included importing parasitic wasps that lay eggs in the fly larva, providing cotton fluff suffused with insecticide that the birds like to line their nests with thus poisoning the larva, and raising male flies made sterile by exposure to blasts of radiation, such a X-rays. With this method, called Sterile Insect Technique, the males mate with females who then fail to lay viable eggs – end of the line. The technique has worked in the United States in the eradication of the screwworm, a livestock pest. That passes for positive in the war against invasives. An evolutionary precursor to walking on land? I’ll get back to more clearly positive human effects on the Galápagos after a few other notes. 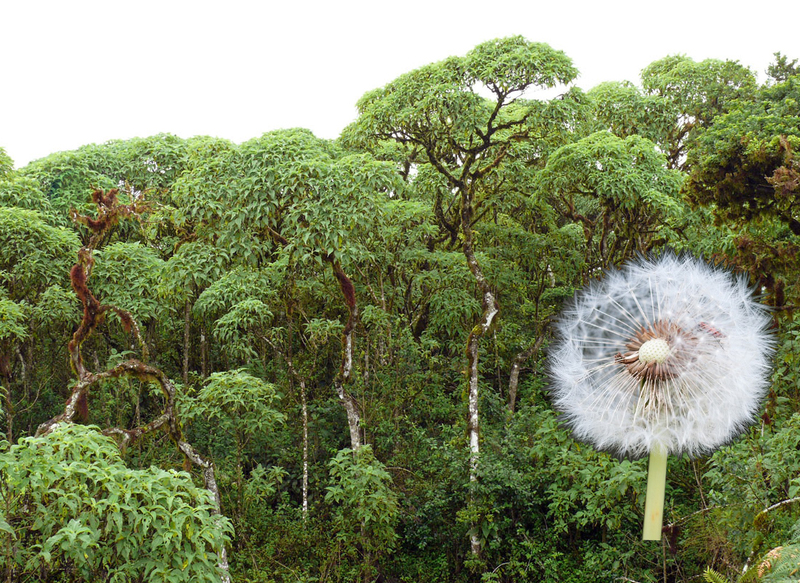 I mentioned the dandelions-become-sixty-foot trees and showed you a picture of both of them above, a few million generations between seeds in the Photoshop inserted image and the trees themselves in the background. 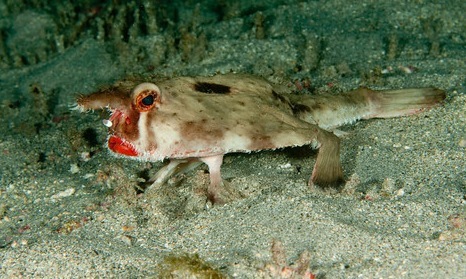 Now more speculation, this time on the red-lipped batfish. If it gravitated toward shore and had a few million years, would it be a progenitor of a whole new lineage skeletal arrangement for land-lubbing appendages and perhaps different designs for wings? Looking at the bizarre batfish I wonder why it doesn’t get more notice as one of the strange evolutionary marvels of the Galápagos. It reminds me of the coelacanth, that living fossil fish first discovered off the coast of South Africa in 1938 near Port Elizabeth. A later rare catch I remember firing my imagination when I was in high school. The enormous specimen – they can get up to 200 pounds – brought up by a startled local fisherman and quickly taken to highest local experts available, was over five feet long. It mightily impressed my teenage mind at the time. They were in the fossil record, frozen in stone 66 million years earlier and presumed long gone – very long gone. But rare live ones it turns out were still patrolling around in the very deep seas below. Their four lobed fins look suspiciously that they could be leading, like the lungfish with it early version of lungs, toward the terrestrial tetrapods – all us vertebrata with four appendages from them up through amphibians to reptiles to dinosaurs and birds on one branch to mammals on another branch, including us the upright version, also with four limbs, but two called arms, as two in birds are called wings. That seems pretty conclusively the lineage. Why then among us folks who like to study evolution should the batfish be noteworthy? Well, you know I’m an amateur at this and not a thorough-going scientist, but… the leg/fins and flat body architecture of the batfish looks quite different than the coelacanth and most primitive of amphibians, by appearances tending to be jointed differently and structured out from the body quite differently too. It’s mode of movement, pictured in a number of YouTubes, is also unique as a mix of paddling and walking the bottom. Of course there are other differences, such as the strange “nose” or “horn” between the eyes, the dangling white spherical “lure” some scientists think is for attracting prey close to it’s outlandish bright red lips, gates to a waiting stomach and so on. My friend Stacy Becker in Arcata and McKinleyville (work and cultural life in Arcata, home in McKinleyville) way north up the wild California coast by the tallest trees in the world, during this soggiest of rainy seasons, learning of my near fanaticism for the Galápagos gave me not one but three books on the subject. That included Kurt Vonnegut’s novel Galápagos. During an economic crisis quickly descending faster and deeper than the Great Depression of the 1930s and spreading around the world, a random selection of his colorful and twisted characters are trying to get on the boat for “The Nature Cruise of the Century” and off to the islands from Guayaquil. With scheduled sailing the next morning, things are disintegrating fast. The narrator is a ghost invisibly watching who has lived one million years into the future and has come back to 1986 to witness this last of all evacuations which was supposed to be a luxury cruise to the Galápagos, where, it turns out, humans will evolve into the deep, deep future, isolated like the other plants and animals were there three to five million years earlier. Our narrator ghost refers once in awhile to the problems that humans’ big brains delivered them in greedy, irrational and ever entertaining if often destructive, depressing behaviors. But it was a good thing, anyway, that over those million years since 1986 their brains evolved to be much smaller and more reasonable, albeit with memory a little more spotty. Plus, they couldn’t get as much done with flippers instead of hands, which was good, adaptive. Their bullet-shaped heads, though, made it much easier to catch fish, just directly – gulp and chew. You don’t need plates and silverware for that. Why bother if you can swim fast? Plus, flippers can’t handle knives, forks and spoons very well. Well it’s a long tale and fun if terrifying to read so I’ll just say he weaves together a truly engaging near-end of the world tale with a lot of interesting speculation about how some things end, and how others evolve. Finding the advertisement above on the Internet for travel to the islands tilted my editorial opinion to include this brief intro to Vonnegut’s book – he tells of latter day humans lying around on the beaches like seals. Of course one million years after “The Nature Cruise of the Century” became a vague memory for humanity, if any memory at all, there would be no means to make shorts and sun glasses. Exploring the Internet I ran into Scott Henderson and his wife Maria Elena Guerra. They bought an abandoned farm some years ago not too far from Puerto Ayora up hill into the moister zone. They thought they’d try some profit making farming and some soil building and native habitat restoration. They were also working for Conservation International, a very effective environmental organization protecting and working to restore natural geographies in many parts of the world. Scott is Vice President for the Eastern Pacific Region. Though only 3% of the land in the Galápagos is available for building structures and farming and 97% is off limits to such activity as part of the Galápagos National Park, the population is relatively small there and the land area relative to that, even at 3%, fairly ample. 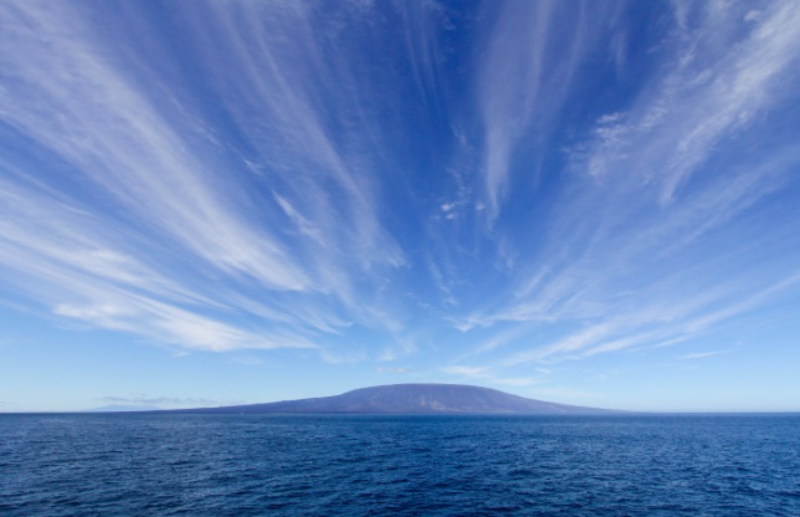 The fact that only 20% of the food consumed on the islands is grown locally and the rest imported indicates it is doubly important to develop agriculture, not just to feed people, but to reduce the total quantity of biological imports, as with every load arriving, even with stringent controls, there is a slight chance of introducing a new invader. The native plants were hard to find among the invasives as Scott and Maria Elena began clearing out the underbrush beneath the scalesia trees. To their surprise, there were a dozen healthy coffee bushes there, shade grown, as they say. Good idea! Now they not only protect endangered species such as the sharks of the region, hunted for fins for shark fin soup prepared some 9,000 miles away, but they also raise and market a range of vegetables and certified organic coffee. About one of his favorite sea creatures, Scott says “Sharks are worth more money alive than dead” – attracting tourists. Despite their reputation, he says, “They don’t bother people much.” One might worry just a little about “much.” But he’s got the Galápagos data to prove it. So I asked the obvious question when talking with Richard Knab “Strategic Partnerships” leader for the Galápagos Conservancy by phone to Fairfax, Virginia. “I haven’t gotten through to Scott yet, but, how’s the coffee?” “Great!” he says. By coincidence, shortly after I’d finished my first installment of this series of three articles on the Galápagos I was visiting Sanford University and perusing their bookstore. Darwin’s Ghosts – the Secret History of Evolution jumped off the shelf and into my hands. I bought it and had it read and pretty well digested by one week later. I was especially delighted to see that the author, Rebecca Stott, had put together her own list of historic evolutionists who preceded Darwin. I’d missed most of hers so it was a delight to see who and why she included. So Darwin thought hard about it and in succeeding editions took pains to revise his list, adding some and subtracting some according to the contributors he considered important enough to qualify to be on such a list. Stott missed – of course – those who came after Darwin who couldn’t be among his ghosts yet, who were on my list: Teilhard de Chardin, Paolo Soleri, Lynn Margulis and Robert Laughlin, whose contributions I emphasized in my article from two months ago. But what I think is most intriguing in trying to think through the list, and the full swath of evolutionary theory – is that it goes a long way toward a greater understanding of the thing itself, that is, the universe evolving through it’s entire existence, accelerating its expansion and encompassing not just biological/ecological evolution but everything else from the “big bang” to the “big crunch” if some way or another the expansion reaches some point and begins to shrink back to a center. Or perhaps it will continue outward to a heat death of all in existence… and on to infinity? I’m planning a third article linked with this one and the one before. All three are something of a dream unfolding at this point, and a very good idea: uniting ecocity ideas with evolution theory in the birthplace of Darwin’s work on the subject by building an ecotown. It would be augmenting the pioneering work that is already on the Islands while introducing some crucial new ideas and approaches. I have hopes the project will involve the following people and others I’m trying to link with firmly. Their work is important and some have already been very helpful to me in formulating ideas and leading me to more information and contacts. • Rosalia Arteaga Serrano President of the FIDAL Foundation in Quito who hosted me to a number of talks there and has been encouraging and in frequent touch with me since that trip to her highest capital city in the world. • José Merlo the innovative agriculturalist I met at the FIDAL Foundation whose descriptions of what he and others were doing in the Galápagos sparked the idea of working on an ecotown for the islands. He has had considerable on-the-ground advice for me already. • Ron Chilcote of the Foundation for Sustainability and Innovation, who has helped with grants to Ecocity Builders before and expressed both interest in this effort and has supplied a number of good ideas and leads to important information. • Richard Knab, of the Galápagos Conservancy who has already made a number of important suggestions in our phone conversation and given me another good reason to travel there. • Maria Elena Guerra whom you’ve just met. • Then perhaps friend and brainstormer with me recently on many things ecological but especially to date on waterway restoration in the San Francisco Bay area, Mark Rauzon. 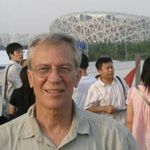 He is also author of several books on ecological restoration of island environments, Isles of Refuge about such work for the Northwest Hawaiian islands, and Isles of Amnesia about best of restoration work throughout the central and western Pacific on, among other islands, those that were used by the United States for nuclear bomb tests. • Then definitely Rebecca Stott for theory content. So until next time; then we will look at some of my specific planning and design ideas beginning to accumulate. Expect in two months my description of long-term strategy and some new drawings from me. I’ll probably try illustrating the sort of changes that might gradually transform Puerto Ayora on Santa Cruz Island, while also proposing a more fast track neighborhood of a few blocks of the sort we in the business call an “ecocity fractal” – a built environment with all the essential features of an ecologically truly healthy community present there and well arranged. May we literally build a happy, healthy future.